What would happen if you took three members from three of Ottawa's loudest bands and had them make music together? The simplest answer to that question remains the most truthful — it would result in something louder. The appeal of local trio Blue Angel lies not only in the thunderous decibel levels of their music, but also the attention they put into the visual element of live performance. 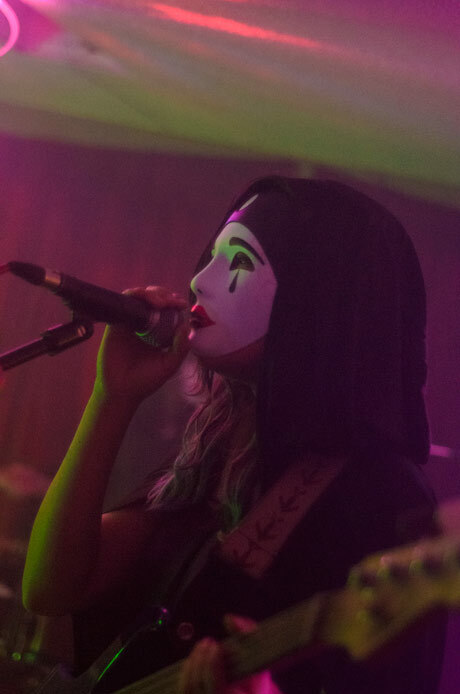 From the fog machine-induced haze (yes, they brought their own) emerged three figures clad in flowing black robes, each wearing a white mask painted with ruby red lipstick and a solitary teardrop from the eye. Watching the three onstage hidden behind the inexpressive stares of the masks resulted in a viewing and listening experience both intriguing and unnerving. Each member's vocals and Lidija Rozitis' guitar remained barely distinguishable over the overpowering wall of noise, driven forth by Sam Pippa's heavily distorted bass guitar and the crashing drums of Caylie Runciman. It was a crushing experience for the eyes and ears.